Image above: Wheat seedlings from above in normal color (RGB), false color infrared (NRG), and normalized difference vegetation index (NDVI). My last flight of the day on iFarm Saturday was over Dorn's field trial of seven wheat varieties. As the dual camera infrared KAP rig snapped synchronous pairs of visible and near infrared photos every 10 seconds, a handheld NDVI scanner was making a transect across the field. Maybe we will be able to compare results someday. It was probably a little early in the season to make good comparisons because the wheat plants are still small and most of the view from above is soil. So a spatially integrated NDVI value will mostly be averaging NDVI values for soil which have little meaning. However, the average NDVI value will be higher where the plants are larger and denser, so some measure of wheat biomass per area is possible. Maybe Dorn can outline on one of these images where each variety is and what their names are. I hope the goal is to grow the most fabulous wheat berries ever, but it's probably not possible to improve on the ones in the salad Dorn served us later. Shadows do not seem to affect the NDVI values in this close-up view of wheat seedlings. We have noticed that the single camera NDVI images often have anomalously high NDVI values where it is shady. So it was good to see that the dual camera system can sometimes handle shadows well. Although the late afternoon shadows are conspicuous in the RGB and NRG images, they disappear in the close-up NDVI image above. However, in the more distant photos used in the big image at gigapan below, the shadows of people and the tree have higher NDVI values (click the snapshots). I am not sure how to explain the difference. RGB: Normal color photo from the unmodified camera. NIR: The photos from the modified near-infrared camera. NRG: A near-infrared channel from the modified camera is displayed as red, red and green channels from the unmodified camera are displayed as green and blue, respectively. NDVI: Normalized difference vegetation index. 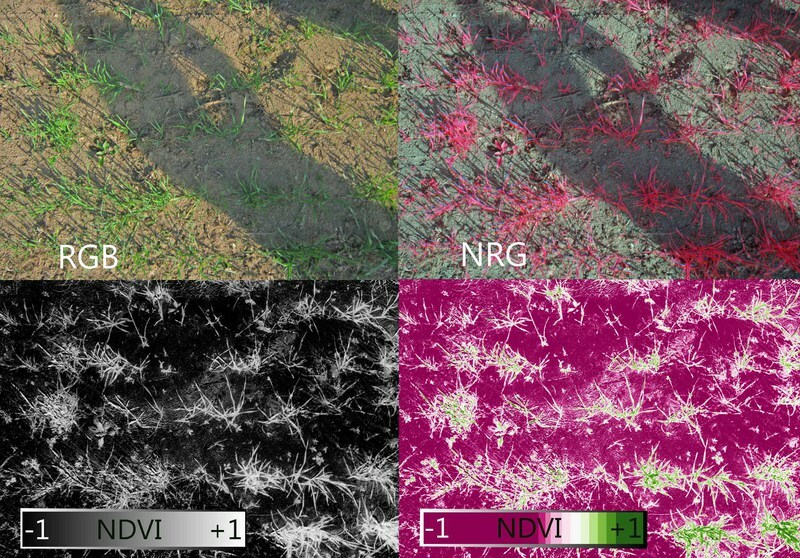 For each pixel, NDVI=(NIR-red)/(NIR+red). Great shots. The impact of shadows on NDVI will vary with the darkness of the shadow. Lower pixel values (darker shadow) will be more likely to produce unexpected NDVI values. Ned, your explanation suggests that exposure is critical. The shadow in the close-up is essentially the same as the ones in the gigapan - a shadow of a person standing in the field. The difference is that the close-up was exposed for the average of shadow and sun, and the distant shots were exposed mostly for the sun-lit field so the shadows become darker. To avoid dark shadows, exposure compensation could be set to a positive number (e.g., +2/3), although that would tend to overexpose highlights. I guess dark shadows would have to be avoided in both channels (VIS and NIR). A good camera with greater dynamic range will also help. Increasing dynamic range will go a long way in improving NDVI results in the shadows. There are some high-dynamic-range image processing methods that combine multiple images acquired at different exposures and the results look stunning. I haven't tried it but it looks like it would be a lot of work without a decent work-flow. I also might be tough to get good results with moving cameras. Maybe that could be another ImageJ plugin but I'm not sure there is much interest. Some cameras have a broad dynamic range but it would be tough to beat what you can get by combining multiple exposures.